Today, we have the most refreshing Mediterranean home design for you to enjoy! Designed by professionals Margarotger Interiorisme, this home is modern and contemporary yet incredibly soothing and peaceful. It features earthy tones, comfortable furniture and of course, a strong Mediterranean twist. As we explore this home, not only will we learn how we too can create a fabulous design that merges function with style, but we will also learn just how beautiful a Mediterranean style is. For South African homes, it can bring an exotic flair to our design and decor, with a wonderfully homely look and feel. From the first image, we can see just how grand and impressive the home is from the outside. It is several storeys high with a sandy-stone wall that brings an old-school Mediterranean charm to the look and feel of the exterior space. 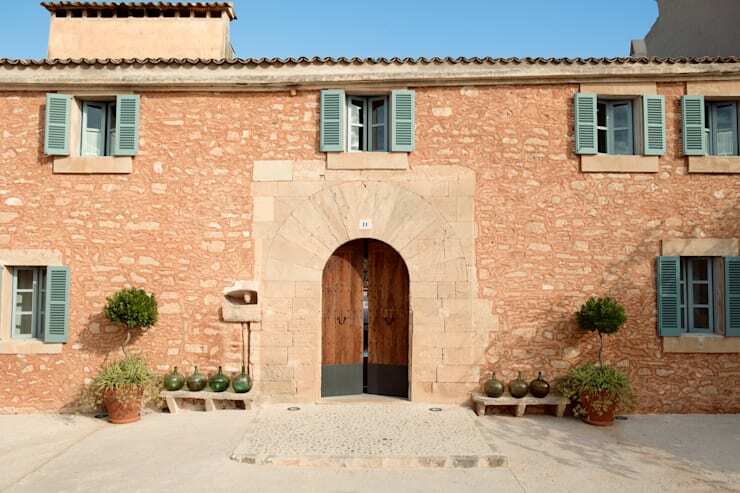 This is enhanced by the arched wooden doorway, which is rustic and almost makes it feel like you are entering a castle when you walk through the front door! The pale blue shutters are a gorgeous touch to the facade, bringing in a bit of colour and a bit of personality. The benches, plants, trees and flowers are neatly arranged, enhancing the design of the home. This is a great tip! Invest in your front garden and you're already halfway to a beautiful and entrancing home design. If we stay outside the home, we come across this gorgeous terrace. 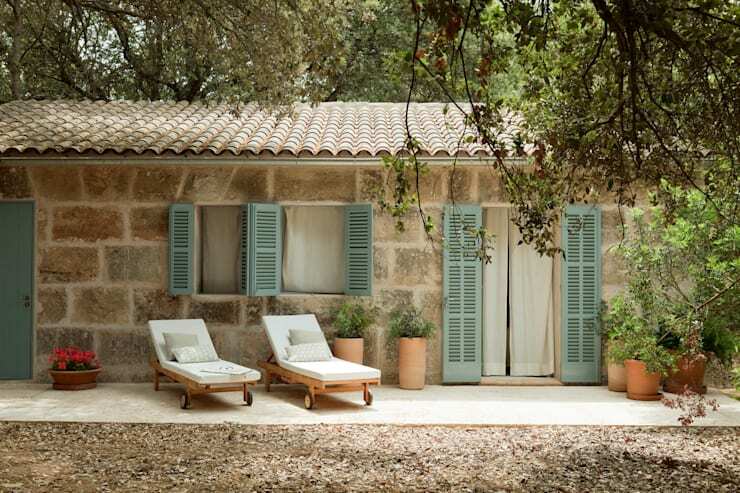 Not only do we really get a sense of how the stone walls work in harmony with the pale blue shutters in this image, but we can also see how there is a wonderful synergy between the interior and exterior spaces. Large doors and windows allow for this, while the soft white curtains ensure that the interior space still remains private. The terrace features two very comfortable looking sun loungers, where family members can relax and enjoy the sunshine and fresh air as well as the beautiful greenery that surrounds the home. The clay pot plants add a natural and subtle form of decor, which is simple yet very sophisticated. This is truly a picturesque space. If we head inside the home, we can see how simple remains a prominent theme, achieving the most beautiful results. 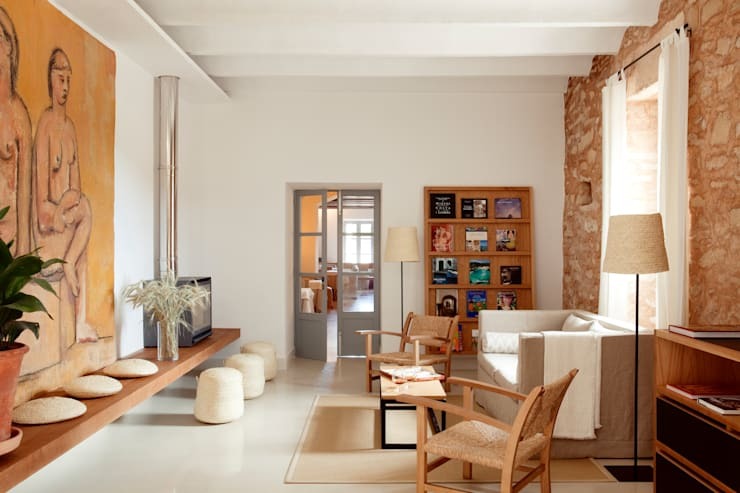 The living room features a stone wall, which contrasts with the smooth white plastered walls around it. This brings in that earthy, Mediterranean and rustic touch to the space. This is further enhanced by the smooth wooden furniture and the sandy-beige sofa. The designers have added a wooden bench to the far wall, which has been used for the television as well as a few decor items, including a vase of fresh flowers. This is a great decor tip for any room in the house as it is refreshing yet simple and stylish. A bookshelf has also been installed in this space, where books can be stored in a neat and organised way, while remaining on display. This is a great tip for any home! Have a look at these things to consider when choosing shelves. As we continue to tour the comfortable yet trendy living spaces in the home, we can see how artwork plays a big role. The paintings and drawings used throughout this space have been very carefully selected, introducing charm and personality into the home. This is a very important tip! Your home is an extension of who you are so it should represent your tastes and interests. Don't be afraid to add a sculpture or a painting that speaks to who you are. The dining room is one of our favourite rooms in the house! It features a country-style wooden table with a bench on each side. The far bench is furnished with all sorts of colourful and patterned cushions, which bring comfort and style to the dining area. What we love about this space is how much room there is for the whole family to come together over a delicious meal. This is truly the heart of the home where joyous occasions can be spent together. 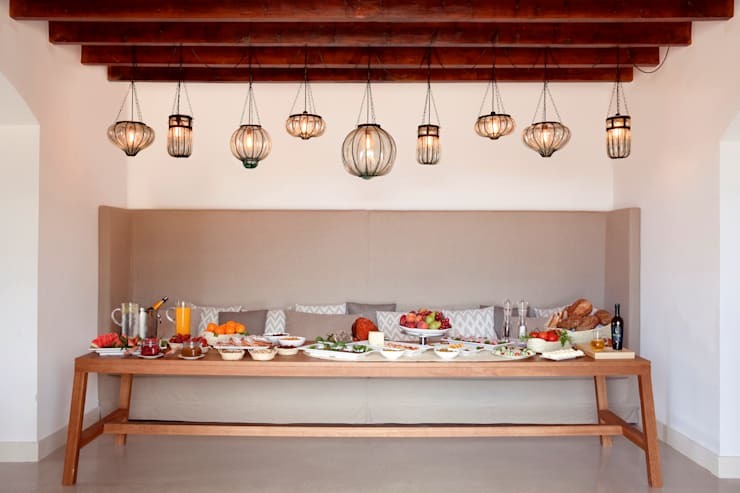 The lanterns that hang from the ceiling are in different shapes and sizes, bringing a charming look and feel to the space as well as creating a beautiful ambiance throughout the room. 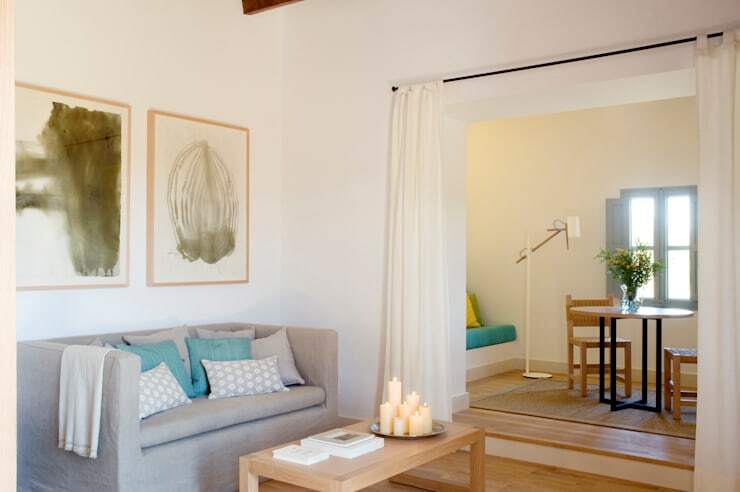 The bedroom has been designed like a little cave or alcove where the residents can truly find peace and inner calm. The neutral colour palette promotes serenity and tranquility, while the soft lighting utilised throughout the room makes for a very romantic look and feel. 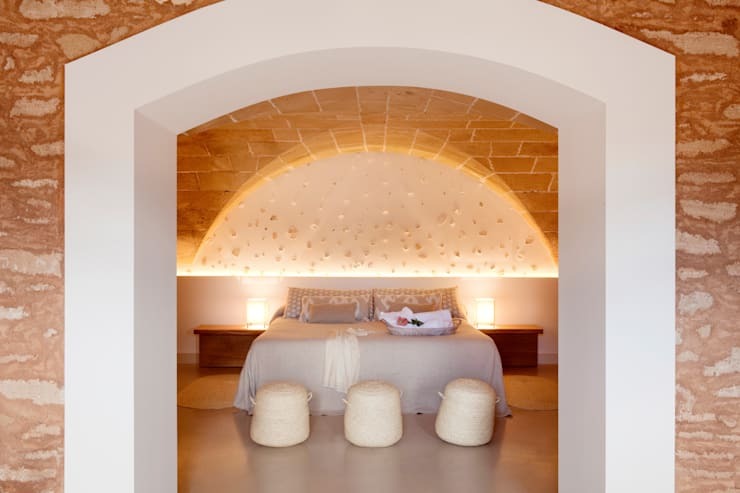 The stone wall in the space brings in warmth and texture, illuminated by the soft lights. Tip: Opt for lanterns, lamps or even candles in your bedroom to create a wonderful soft glow. This will make the space that much more homely and peaceful. 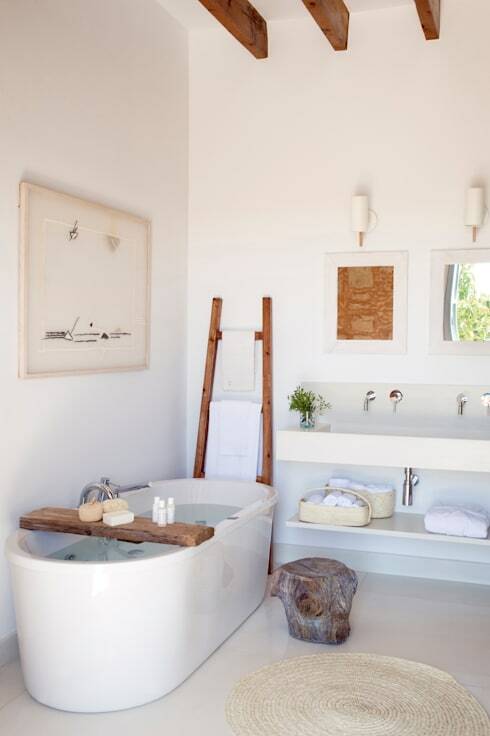 The bathroom features white tones throughout, which makes the space feel very clean and tranquil. The white tones are enhanced by the wooden touches here and there. The modern finishes throughout the bathroom create a very stylish and trendy space where the residents can relax in the bath or brush their teeth while feeling like they are in a vogue decor magazine! The bamboo ladder, which has been used to hang towels is a wonderful way to add storage space and decor to your bathroom all in one go. You'll also notice that there are shelves underneath the sink, which provide plenty of storage space for towels and other bathroom items. If you like this home, you'll love this: Simple facade hiding a charming family home. Would you live in this beautiful Mediterranean home?